It’s true. You can get the “same” part for a range of costs. However, rarely will anyone gain by choosing the cheapest part. That’s why I’m including this post in my series on “Understanding Your Bill,” which also covers diagnostic and labor rates and a mechanic’s pay. OE or OEM (Original Equipment Manufacturer) parts are supplied specifically for your make and model by the manufacturer of your vehicle. They are made to manufacturer-controlled specifications that help ensure safety and longevity for your vehicle. Aftermarket parts, or parts made by a secondary manufacturer, are not always bad. In some cases, aftermarket parts are just as good as OE parts. However, the quality of these parts often depends on both the company (some are more reputable than others) and the standards to which they are manufactured. A parts manufacturer may intentionally create parts that vary in cost, durability, and quality control. If it’s dirt cheap, most likely it is not up to OE specifications, and is likely to fail sooner. Shops that agree to use these cheap, inferior quality aftermarket parts on a customer’s insistence will often not warranty the repair. So, when it fails prematurely, you will have to pay for it to be fixed again. When priced comparably to the aftermarket, OE parts are often the strongest option for proper fit, functionality, and long-lasting reliability. However, if the OE part is much more expensive, an aftermarket part may be a better option if it is a quality part. Some shops, including Marinelli Auto Service, insist on using OE parts or high quality aftermarket parts from a reputable company. This is a sign that the shop cares about you and the quality of care your vehicle is receiving and allows them to be confident in the work they are doing. How Many Parts are Needed to Fix My Vehicle? 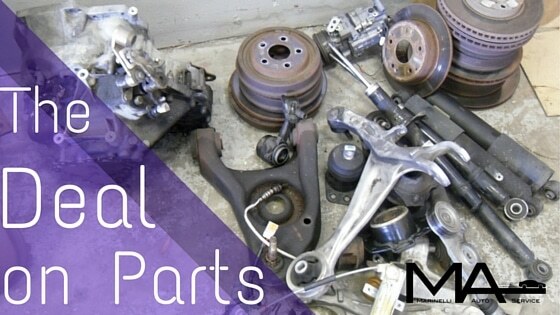 If your car has a certain part failing, it’s not always advisable to replace that part alone. The newest part in the system is only as good as it’s weakest link. While the parts connected to or surrounding the new part may still be functioning properly, if they can’t be trusted to last, it may benefit you in the long-run to replace them while they are accessible. This is particularly important if failure of one of those parts could cause severe mechanical damage. Another value may be that replacing these additional parts while they are already accessible saves you the cost of labor to access them again in a year or two. So, when a technician recommends replacing a group of parts, it’s not always an attempt to take advantage of you. If she is a mechanic you trust and gives you a good reason to replace the part, it’s more likely that she cares about your best interest and is seeking to provide the best long-term solution for you and your vehicle. Yes, it may add to the cost of the repair today, but it may also prevent further (potentially bigger) issues down the road. The answer to this question goes back to the shop’s overhead costs. The cost of running all aspects of the business has to come from somewhere, in addition to making a profit. Thus, many shops establish a formula of balancing these costs between their labor rate and marking up the parts. Some shops have a higher labor rate and lower or no parts mark-up. Others have a lower labor rate and a higher parts mark-up. There could be two shops with two different pricing structures that are bringing in the same profit. Marinelli Auto Service values a fair labor rate and we don’t sell cheap parts at a high mark-up. So, should you listen to your brother? I think your brother may have been well intentioned, but misinformed. I hope this series can help you (and your family and friends) have a better understanding of your bill in terms of diagnostics and labor rates, a mechanic’s pay, and parts mark-up so you can make more informed decisions about your vehicle.